I took this yesterday at 5:pm. I was just telling myself I need a photo of a Tern in its winter cap before spring hit and there he was waiting on the dock for me. The Book says 'seldom seen in Belize ' but I see them everywhere. If you sail or motor up to one of San Pedro's many docks, you're greeted by a group of comical-looking white birds with zany black hairdos and long orange noses called Royal Terns. During the day the terns stand in flocks on the ends of the docks in town, facing the wind very uniformly and when the trade wind blows from the north-east, all the terns turn to the left. And when the breeze comes from the South-east, the terns all turn to the right. Our island and reef run predominately North and South, so if you're sitting in one of San Pedro's many bars overlooking the reef, you're seeing another end of the Royal Tern. The family is Laridae and includes all gulls and terns with about 80 species. Long, large wings and a good fishing bill make this tern one of Ambergris' successful fishing birds, and it even wears webbed feet for a little swimming if it has to. 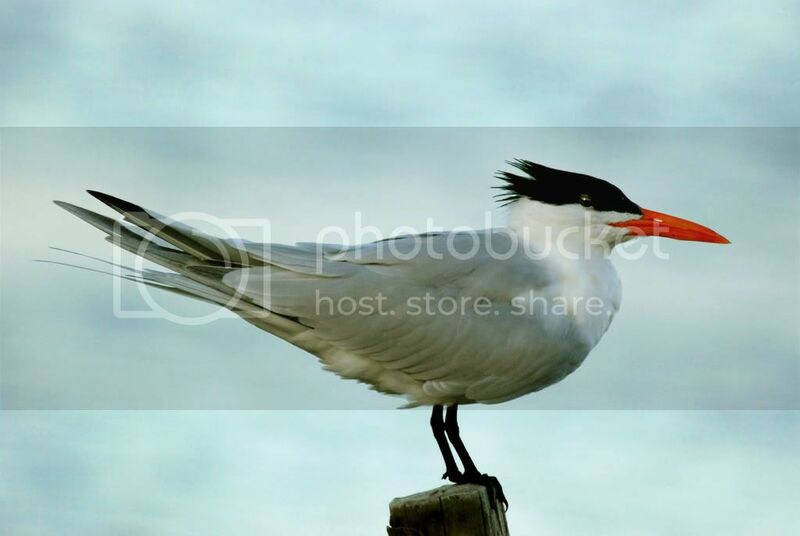 Terns are excellent flyers and able to fish well offshore. They breed in monogamous pairs, always nest in colonies and build a crude nest on the ground or grasses deep in the Savannah's protection. Our island is home for hundreds. They have a high-pitched voice of "Keerr, kree, tsirr" like a sea gull. In my reading I find birders seem to disagree about one point or another consistently. The Royal Tern is no exception. One book says, "The Royal Tern is a thief and steals fish from frigates and other birds," the next book will say, " The Royal Tern's fish are stolen by frigates." The only way to really find out is to see for myself, so I went down to Cholo's Bar & Pool Hall at the beach and made myself comfortable in a stool overlooking the docks where 100 or more terns, gulls and frigates seem to be having their afternoon meal of sardines and scraps from the fisherman cleaning the catch on the dock. A frigate swooped down and scooped up some fish parts from the surface of the water and another accosted him in mid-air causing him to drop the object of their confrontation, only to fall another few feet and get caught in the air by a tern when suddenly another tern collided head on in a cat fight with Tern#1 only to lose everyone's desired prize into the water below. Surprised by this free-for-all and still uncertain who steals from whom, I turned to one of our knowledgeable local guides having a beer on the stool next to me and asked, "Who steals from who? The tern or the frigate? He replied, " Well you should know, gringo. You're the one who writes about birds." Great picture, nice story, but the closing phrase is a real something. So many wonderful photographs! I'm not a birder... but I would become one in an instant I believe in your environment! I'm adding you back. How did you find me? your photography of the birds.